• Model Available : 3HP & 5HP. • It is most suitable for Large Quantum Sifting & Milling. • It is Portable, Compact in Design and Totally Vibration Free. • The product feed & Discharge being a continuous process, the entire system can be provided for online Applications with Dust Free arrangements. • It can be easily dismantled, Cleaned and Assembled in a short duration. • It need less maintenance & Power consumption than the conventional sifters. 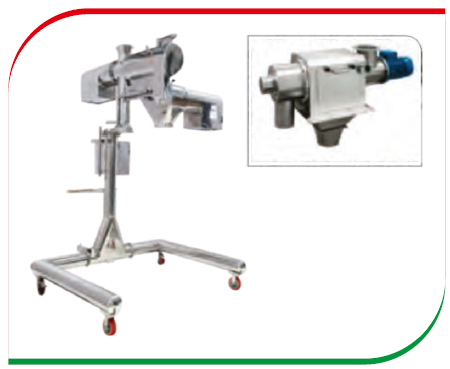 • Castors wheels provided in the bottom for easy Mobility. • GMP model with documentation (IQ, DQ, PQ,OQ).